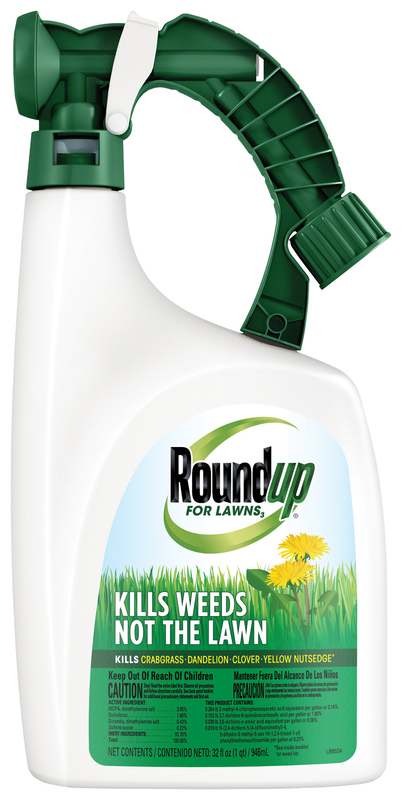 Roundup® For Lawns3 is a formula that kills weeds, not the lawn! It controls over 250 common lawn weeds, roots and all, and is especially effective on hard-to-kill weeds such as crabgrass, dandelion, clover and yellow nutsedge. The ready-to-spray applicator is great for broadcast application to your entire lawn and covers up to 5000 square feet. This fast acting formula starts killing on contact and kills weeds down to the root so they don't come back. In addition, its rainproof in as little as 3 hours! Roundup® For Lawns3 is a simple step towards a beautiful, weed free lawn. For Kentucky bluegrass, Annual bluegrass, Tall fescue, Red or fine leaf fescues apply as specified on label. This product may be applied to dormant bermudagrass, dormant zoysiagrass, and dormant bahiagrass. Use caution when applying this product to warm-season turfgrasses when turf is going into dormancy in the fall or coming out of dormancy in the spring as some injury may occur. Do not apply this product to St. Augustinegrass (all varieties) below 50 degrees F. Do not apply to St. Augustinegrass (common varieties) when temperatures are above 85 degrees F unless temporary turf injury can be tolerated. Do not make applications of this product to St. Augustinegrass when turf is going into dormancy in the fall, or if temperatures are expected to drop below 40 degrees F within 10 days of application. Ready the Spray Hose-End Sprayer. Measure the entire area to be sprayed. For rectangular areas, multiply the length by width to obtain the total square feet of your lawn. Follow the directions on the label for the application amount based on the size of the area to be sprayed. Spray evenly over the entire measured area. Connect:Shake well before using. Connect sprayer to the hose. Turn on the water. Extend the hose to farthest area of the measured area to be treated. Spray: To begin spraying, point the nozzle in the direction you want to spray. Slide the thumb activation switch forward to the ON position. Spray evenly over the measured area. Finish:To STOP spraying, slide thumb activation switch backward to the OFF position. Turn of the water. Relieve the water pressure by sliding thumb switch to WATER ONLY position until water slows to a drip. Slide switch back to the OFF position. Disconnect sprayer from the hose. DO NOT USE on lawns containing bentgrass, St. Augustinegrass, bahiagrass, centipedegrass, or carpetgrass. Also, do not use on dichondra or lawns with desirable clovers or legumes. Do not use on vegetable gardens, fruits, o oor ornamentals flowers, trees, groundcovers, hedges, landscape/flower beds and shrubs. Apply this product to actively-growing weeds during the early growth stages for the best results. Apply in spring or fall when daytime temperatures are between 45 and 90 degrees F. Fall applications may control winter annual and biennial weeds that may over-winter and flower the following spring. For heavy grass weed pressure, apply a second application at the same rate, 14 days after the first application. The maximum application rate is 6.4 fl. oz. of product per 1,000 sq. ft. per application. The maximum number of broadcast applications is limited to 2 per year within a minimum of 21 days between applications. The maximum seasonal rate is 13 fl. oz. of product per 1,000 sq. ft.
People and pets may enter treated area after spray has dried.